A card template for a sundial can been seen below. Be careful to cut the outline with scissors (see basic animation below). NOTE, some lines are fold lines. The most important fold is the angle of the main surface, the surface with the scale. This must be folded according to your current LATITUDE. this can be found on an ordnance survey map or on the internet. If you find yourself at a latitude of 53.352000000 simply fold at 53.3 degrees using the angle scale on the card template as a guide. Graphics / images can be added to the card giving a more interesting finish to the model. 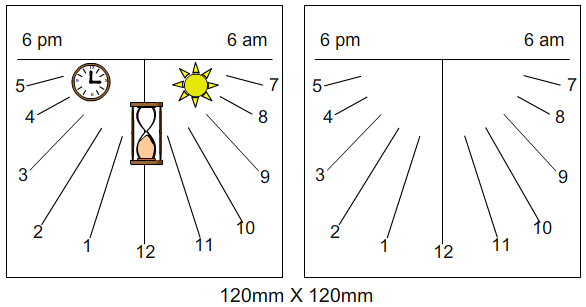 - for example, a drawing of the sun, clock and hour glass. Place the sundial on a level surface and point towards NORTH. Remember, you may have to keep in mind summer time / day light savings. Your sundial may be an hour ahead. A hand held sundial can be made form almost any material including MDF, dowel rod and perspex. The card scale is trapped between the perspex and MDF which can be fixed together using countersunk screws. Two examples of the scale are shown below. One has simple graphics added and the other is a basic scale.